Centurion University of Technology & Management has released the application form for CUEE 2019. 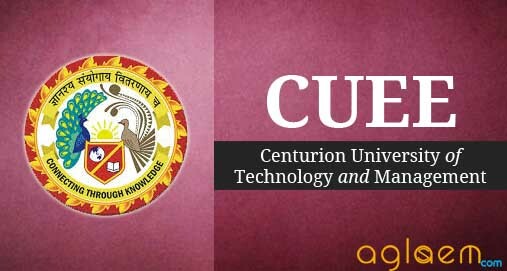 Centurion University Entrance Examination (CUEE) 2019 is a computer based online exam conducted by Centurion University on the official website www.cutm.ac.in. CUEE 2019 is an engineering examination conducted for B.Tech, B.Tech (Agri. ), B.Sc (Agri.) and Diploma in Agriculture. CUEE 2019 has a multiple choice type pattern for the exam. The difficulty level for CUEE 2019 is equal to any national level entrance exam. The Centurion University offers various courses such as B.Tech (Regular and Lateral), B. Tech (Agri. Engg.) and B.Sc (Ag.) courses for Admission in the University. It is a state university of Odisha. Candidates appearing/ passed their 12th exam in 2019 will be eligible to appear in the CUEE 2019 exam. The registration for CUEE is going on at the moment. The article contains information about eligibility, admission procedure, application form, admit card, result, the scholarship of CUEE 2019 on this page. 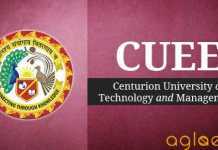 Latest:Centurion University of Technology & Management has released the application form for CUEE 2019. Check it from below. MIT Pune Admission 2019 - Apply Now!! Centurion University of Technology and Management is a multi-sector, private state university from Odisha, India which offers undergraduate, post-graduate and doctoral courses in the fields of Engineering & Technology, Management, and Applied Sciences. Interested Candidates can check the complete schedule for CUEE 2019 exam from the table below. CUEE 2019 follows the Multiple Choice Question Pattern for the exam. There is no marking scheme. The total duration of exam is 3 hours. Centurion University Fees are paid in different stages by the candidates. The fee structure differs for each course offered by the university. Candidates can check the fee structure for various campuses from the official website. The direct link for fee structure is provided below. Click here to check the Refund policy guidelines followed by the University. Given below is the list of the examination centers for CUEE 2019. NIIT University Admissions Open - Apply Now!! Chitkara University Engg. Admission - Apply Now!! Candidates should always check the eligibility criteria for the exam before applying. Candidates can check the criteria given below. For B.Tech(Civil Engineering), B. Tech(Aerospace), B.Tech(Mechanical Engineering), B. Tech(Computer Science and Engineering), B.Tech(Electronics and Communication Engineering), B. Tech(Mining), B.Tech(Electrical and Electronics Engineering),B. Tech(CS Cloud Technology and Information Security), B.Tech( Chemical Engineering and Petrochemical Engineering), B.Tech(Electrical Engineering)- who have passed 10+2 (science with mathematics) examination with 50% aggregate. Admission based on CUEE/ JEEMAIN/ EAMCET/ WBJEE or other equivalent entrance test. B.Tech(Biotechnology) – who have passed 10+2 (science with Mathematics or Biology) examination with 50% aggregate. Admission based on CUEE/ JEEMAIN/ EAMCET/ WBJEE or other equivalent entrance test. B.Tech(Agricultural Engineering) – who have passed 10+2 or an equivalent examination conducted by a recognized board of education with PCMB having 50% aggregate. Admission based on entrance test of CUTM. B.Tech(Dairy Technology) – who have passed 10+2 (science with Biology) examination with 50% aggregate. Admission based on CUEE/ JEEMAIN/ EAMCET/ WBJEE or other equivalent entrance test. MBA (Regular/Agriculture Business/Data Analytics/Development Management) – Graduation from a recognized university. CUEE 2019 Application Form has been released by the university in November 2018. Application Form is available for applying only till 15 March 2019, 11:59 pm. Application Form is accessible by both online and offline mode, from the official website cutm.ac.in. Candidates who are appearing or have completed their 12th Graduation from recognized Board / University can apply for the exam. CUEE 2019 Offline Application Form and Information Brochure are available at the Admission Counters of the various campus of Centurion University. Candidates have to remit the application fee of Rs. 600 for applying. Candidates can remit the fee by Cash, Demand Draft, Debit Card, Credit Card, Net Banking or demand draft by post. CUEE 2019 Slot booking is done at the time of filling the application form on the official website of the university. The process of slot booking includes details regarding candidate’s details which are candidate’s Name, mobile number, email Id. Afterward, Candidates have to select their preferred location, date and time for the exam. CUEE 2019 Admit Card shall be available for the candidates who registered themselves successfully on the university’s official website at www.cutm.ac.in. Admit Card is going to be available by the third week of March 2019. Candidates have to enter registration number for accessing the admit card. Candidates are also provided their admit card directly through Email by the university. The admit card contains details such as candidate’s name, roll number, examination Center, Date and Time. Candidates are advised to download the admit card and take a printout of it. Candidates must bring their admit card and a valid id proof on the day of the examination, otherwise, the candidate will not be allowed to enter the examination hall. CUEE 2019 Result is to be announced in the month of April 2019. The result is going to be declared on the basis of the marks obtained by the candidate in the entrance examination. The result is released separately for B.Tech, B.Tech (Agril.) and BSc. (Agri) courses. Online students are provided their result through SMS or by emailing the candidates on their registered ID and numbers. Candidates can also view their result on the website by entering the registration number. The rank card is sent to individual candidates through SMS or email. Candidates are advised to download and take a printout of their rank card as it is needed at the time of counselling. CUEE 2019 Counselling is scheduled to start by 8 April 2019. The procedure of Certificate and Document Verification is going to be done on the same day. Candidates should bring the photocopy and original documents for verification and submission for the admission process. The counseling process shall stop if the seats are full for the admission. It’s compulsory for the candidates to attend the counseling to get admission. The seats are allotted on the basis of the rank of the candidates. To make the Candidates familiar about the result, an email and SMS will be sent on candidates registered mobile number and email id. Admission letter for the selected candidates will be made available on admission microsite for downloading which contains the details about payment of fees at the time of admission, allotment of Hostel and date, time and venue for commencement of the academic session. The candidates will get an offer of admission only for the specific programme opted by them for the respective session. They are required to fulfill all conditions within the specified time. There may be chances that the Admission committee recommends candidates name in a programme/campus/category for which they have not applied in the application form. For this, an option will be given on candidates admission microsite to change or give the consent for the same. The candidates will be able to download the selection letter only after submitting their consent. Candidates are required to pay the fee within the specified schedule and report for classes after payment. Centurion University Entrance Examination ( CUEE ) is basically a computer based online test for the aspiring students who want to take admission into Centurion University. It is conducted for admission in B.Tech (Regular and Lateral), B. Tech (Agriculture Engineering ) and B.Sc (Agriculture) courses of the University. The entrance exam is mainly a multiple choice type entrance exam and the standard of the exam would be as equivalent to any other equivalent national level entrance exam. If you have any queries regarding CUEE 2019, please ask in comments below. Manav Rachna University Admission - Apply Now! !